BWA Sport 26 + Honda BF 250 In the 2016 season our fleet has welcomed a new member, the BWA Sport 26 GT, powered by the top-notch Honda BF 250 VTEC engine. 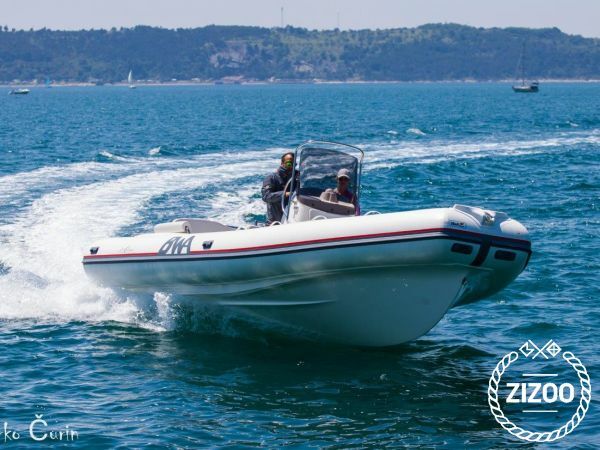 It is an inflatable boat of exceptional quality and is characterized by excellent operating capabilities, has a modern and attractive look and plenty of useful space for crew and passengers. As with most BWA inflatables, its tubes are slightly elevated above the water’s surface, which allows for exceptional piloting of the craft, gentle gliding through over meter-high waves, and has a favourable 20% lower fuel consumption due to lesser water friction. The driver operates the vessel from a centrally located console, sheltered by a big windscreen that offers great visibility. Passengers are seated on closed cell upholstered cushions dressed in a pleasant artificial heat-reflecting material. There is plenty of storage space for all your personal belongings, which will be safely stored in dry lidded compartments fitted with a lock. The manufacturer placed the fuel tank in the deck under the console in the centre of the vessel, thus maintaining a low centre of gravity regardless of the amount of fuel still in the reservoir. The boat offers you shelter from the scorching sun under its Bimini top made by a well-known manufacturer and which has been tested at speeds of up to 60 km/h or 32 NM/h. The Honda BF 250 is a new 4-stroke V6 engine, which is the most powerful and most high-tech Honda outboard engine on the market. The engine is an excellent choice for powering a BWA 26 Sport inflatable and has been awarded top marks at various test-drives. The boat has a top speed of 43 NM/h at 6.200 rev/min and consumes 86 lit/h, reaching hull speed at 12.3 NM = 2.450 rev/min and consumes 10.6 lit/h. The ideal fuel consumption and speed ratio is attained at 28 NM = 4000 rev/min with the fuel consumption at 25 lit/h. Equipped with the latest technology in nautical outboard engines, this engine is fuel-efficient and very reliable. It is fitted with various displays, which enable you to monitor the engine’s performance. It is also equipped with the famous Honda VTEC technology, which allows for geometrical changes in cam lobes and ECOmo (Lean Burn) systems that regulate the optimal mixture of fuel and air, thereby improving fuel efficiency. It is ideal for water-skiing, tubing and visiting remote beaches. The BWA Sport 26 + Honda BF 250 is a perfect combination for new adventures and above all guarantees a nice and positive experience during your holidays. The boat has all the necessary permits and all the mandatory equipment: Ropes Anchor with chain and rope Boat fenders Paddles Mooring hook Life jackets (for kids at costumer’s request) First aid kit Fire extinguisher Manual air pump Compass Bilge pump Radio USB Electricity 12 V Bathing ladder Additional fuel tank (10 l) Deck shower Flags GPS Raymarine Additional equipment: Bimini top Cool box: 20€/week Tube and skiing lifejacket: 30€/week Waterski and skiing lifejacket: 50€/week Wakeboard and skiing lifejacket: 70€/week Banana for 7 persons: 100€/week Takeover: Northern Dalmatia - anywhere from the island Pag to Sibenik - free takeover in the Zadar region, delivery to other locations according to price list or arrangement.